Free range turkey, cranberry juice, dried cranberries, cane sugar, cabernet vinegar, sea salt, black pepper, onion powder, smoked paprika, thyme, sage, garlic, powder, marjoram. The first thing I pick up on my palate is a light sweet, followd by spices of thyme, sage, and marjoram. There's a light tanginess too. The chewing brings on a fruity sweetness, with some natural turkey meat flavors. 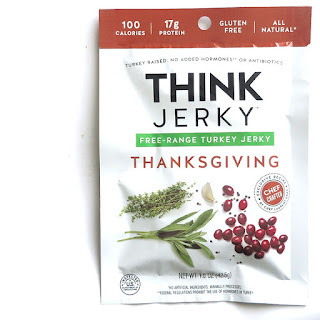 For being marketed as a turkey jerky that tastes like Thanksgiving, it definitely holds up. This has a turkey meat flavor that tastes just like roasted turkey that's been basted in its own juices. I can pick up a fruity, lightly tart flavor that mimics the cranberry sauce touching the slices of turkey breast. The seasonings of thyme, marjoram, sage, create the stuffing mix flavor. Overall, the primary taste profile is that of natural turkey meat flavor infused with the holiday touches of cranberry and stuffing, exactly as the company claimed. The meat consistency is overall good. Very meaty, with no signs of fat. However, I did find one piece with bits of bone and cartilage. But then again, maybe that's like a real Thanksgiving dinner. 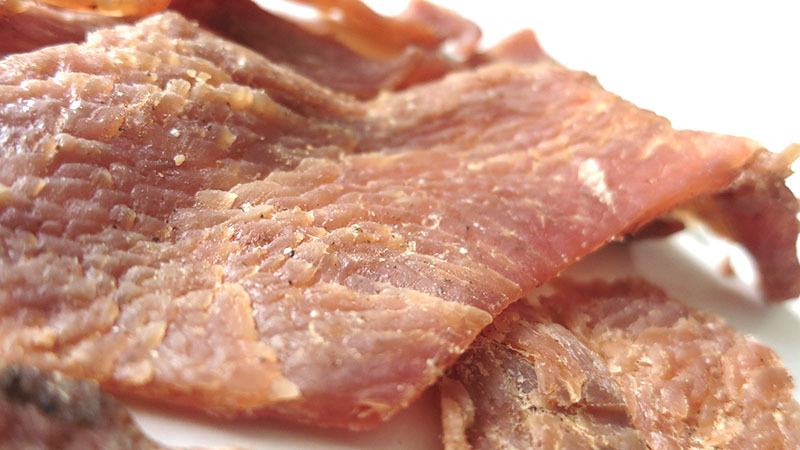 Otherwise, this meat is soft and tender, and chews like real turkey meat, comparable to juicy breast meat. This Thanksgiving turkey jerky from Think Jerky does an excellent job of mimicking the classic American flavors found on the fourth Thursday of November. The turkey meat has a lot of natural meat flavor, but infused with a tangy, fruity cranberry, and a blend of stuffing seasonings. Each bite is like a trio of turkey, stuffing, and a dabble of cranberry sauce. Even the chewing texture is much like real turkey breast meat, more juicy than dry. 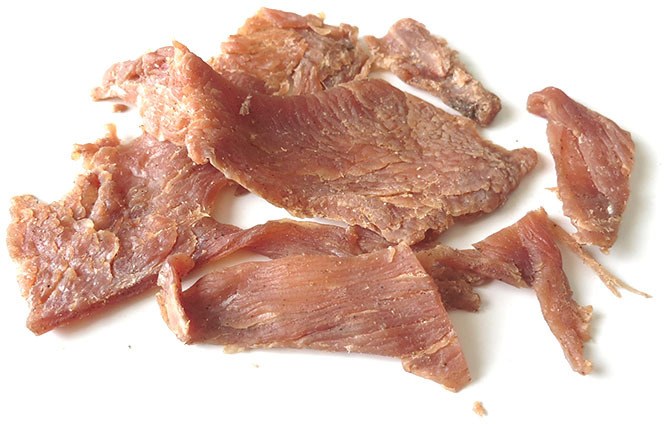 Compared to the company's other turkey jerky, "Sriracha Honey", this actually chews and feels like turkey, and even gives off the flavor of roasted turkey.